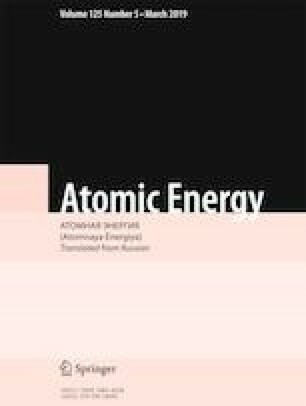 A facility for carbothermal synthesis of uranium and plutonium nitrides for the production of dense mixed uranium-plutonium nitride fuel for fast reactors is described. The synthesis reaction occurs at 1650 ± 50°C in nitrogen and nitrogen-hydrogen atmospheres in six high-temperature batch furnaces of the horizontal type. Tests performed on the pilot model of a furnace showed good agreement between the experimental and computed temperature distributions along the longitudinal axis of the furnace. The facility operates in an automatic mode; control and monitoring of the technological process are performed remotely. Translated from Atomnaya Énergiya, Vol. 125, No. 5, pp. 284–287, November, 2018.